Review: “Anna Hibiscus lives in Africa. Amazing Africa.” Anna Hibiscus is a darling young African girl who has an enormous family and values not only her family but also her heritage. In Anna Hibiscus by Atinuke, readers learn about Anna as well as African culture through four charming stories. Readers get to experience an African holiday and learn about the importance of family to the African people in the first story, “Anna Hibiscus on Holiday”. In the second story, readers learn what happens when one member of the family returns to Africa to visit after moving to America. The culture of Africa is stressed in “Auntie Comfort”. In “Anna Hibiscus Sells Oranges,” Anna learns about poverty and being selfless. And finally, Anna’s greatest dream is to see snow. Can she find a way in “Sweet Snow”? Atinuke has done a wonderful job bringing the culture of Africa to early readers. 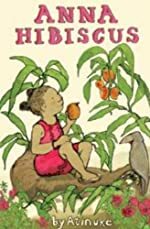 Anna Hibiscus is a good book for early elementary school children, and each story emphasizes an African value that can easily be related to any culture. Children will learn about the power of family, love, and hard work after reading Anna Hibiscus. Each story truly stands alone, and therefore each story begins in nearly the same way – with an introduction to Anna and her heritage. The anecdotes that Anna shares are heartwarming and humorous, for example in “Anna Hibiscus on Holiday,” she resorts to tying her baby brothers, Double and Trouble, to the table bench in order to keep them from crawling over a ledge. Her auntie humorously jokes about them confusing the boys for goats. If the desire is to find a delightful story that will not only engage an early reader, but will also instill values, then Anna Hibiscus is an optimal choice. We would like to thank Raab Associates, Inc. for providing a copy of Anna Hibiscus for this review. Have you read Anna Hibiscus? How would you rate it?